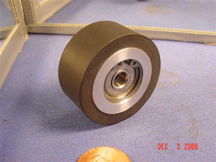 Listed below are pinch rollers that I've build for various machines. The spec's and diminsions were taken from factory rollers. Whether your roller is missing or you just want a spare, these will work very well. 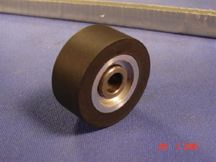 They have new rubber which will last for years, and depending what style roller you have, it will have a new roller bearing or new oil bronze bushing reamed to the correct size. They all are guaranteed to work 100%. There are several rollers in the works to be made, so if your roller isn't listed feel free to email me and ask when and if it will be reproduced. All rollers $65.00 unless noted.